For the last two Sundays I’ve had the blues. Why? Because my evening is void without the hour of one of the best TV series, written and acted — Vince Gilligan’s Breaking Bad. The show first aired in 2008, and I was hooked from the start. Having been diagnosed with terminal cancer, the timid high school chemistry teacher, Walter White, turns to a life of crime — for pretty much all the right reasons: his wife, his son, his unborn daughter — his family. There was also something more to it for me, though. My husband was also battling terminal cancer, and so, together, we brought our own “real” life experience to each and every episode. Losing ourselves in the fiction wasn’t always an option. My husband would joke about the ways he might “provide” for us all. Managing dining properties across a large public university did not, however, open up many opportunities to manufacture methamphetamine. And I somehow doubt, that his Zen-like nature could’ve been transformed into the villainous, kingpin Heisenberg. Roger was just too much Mr. White. But there was enough of “something” in us both that continually drew us back each Sunday for the hour, of, more often than not, brutal, violent, viewing. We liked to boast that we were intelligent viewers. Whenever a preview for a TV series was off the charts, smart, we knew it wouldn’t last. Breaking Bad, thankfully, was the exception. It was smart. It had all the Shakespearean elements of revenge, lust, betrayal, sacrifice, and survival. Every character was complex; mostly they were degrees of “bad.” And Walter White was bad, through ‘n through. He just didn’t realize it. And a large part of the success of the show was that we, the viewers, didn’t either. It was one of those shows where you looked at each other, shaking your head, exclaiming, “oh, no he didn’t.” “Tell me he did not just…” Time and time again. A show like that can only truly succeed, though, if the protagonist (in this case, turned antagonist) possesses legitimate driving motivation. Breaking Bad managed to pull in 10 million viewers for its finale, and I’m betting that each and everyone of us was still rooting for Walt, not only recognizing, but believing in his motivation. For me, it was simple. I wanted Walt to survive. Of all the Shakespearian elements, the predominant theme and motivation right up to the last breath was survival. Vince Gilligan turned Herbert Spencer’s “survival of the fittest” on its head. From the beginning of the show, when my husband and I had watched Breaking Bad together, there had always been that truth, that reality. That no matter what Walter White did, he’d finally succumb to an early death. As unattractive as they were, Vince Gilligan threw in plenty of scenes of Walt, weakening and frail, coughing up blood, fading a little more with each season and each episode. Interspersed with the hour’s escape from our own reality, were the most frightening and real moments of the show — the doctor’s visits, the chemotherapy infusions, the reminders of why Walter had embarked upon this journey in the first place. At these moments I wanted to switch channels. The far-fetched series had become all too real. The third season of Breaking Bad concluded on June 13, 2010. And my husband died five months later. Every episode of that season I prayed he’d make it to watch the next. One of the hardest parts of living with someone who is dying, is knowing that you’ll be living the “future” without them. It’s the little things, the day-to-day small pleasures like settling in at night to watch Breaking Bad, or Sons of Anarchy, or The Walking Dead, that suddenly become such painful reminders of all I’ve lost. When Walter White exclaimed, “I was alive” it was one of saddest moments I’ve ever viewed on the screen. So much so that it’s taken me two weeks to complete this blog. I’ve been stuck, once again, in my grief. This week I realized I had to take the advice I always give to my daughter: the only way through grief, is through it. So this may not be the most eloquent of posts. It is a way for me to say yet another goodbye to my soul-mate, and words are simply inadequate. I do think Roger would’ve loved the finale of Breaking Bad. I know there would’ve been a part of him that totally got Walter White. Regardless, that nearly every moral and biblical code in life played out: the ends didn’t justify the means, pride came before the fall, the wages of sin were death, and he got what he deserved (could the Badfinger finale have been any more perfect??) — Walt didn’t lie attached to an oxygen mask, surviving on an intravenous feeding tube and a morphine drip. He outlived and outsmarted every foe and went out in a blazing flame of glory. A perfect ending to a near perfect show. Goodbye Mr. White. I’m going to miss you more than you’ll ever know. I’m sorry to say, I have never gotten to watch this show. But both Sara and I are now interested in downloading back seasons from NefFlicks for something. So sorry for your loss, dear Nikkie! Thanks Kathy. It’s worth the time you’ll spend! Wow! I’ve just finished reading your post and I must say first and foremost that I am sorry for your loss. I’m only twenty-eight and haven’t experienced any close losses of my own, so I can’t even begin to imagine what you must’ve gone through. This piece is excellent. Saying it’s well-written is beside the point—what this piece does so well is highlight the merits and the deeper meanings behind the show, its many nuances and the elements that spoke so broadly to countless women and men across the country. The main character Walter, as you stated, was someone that you weren’t aware was bad, though in so many ways, he proved he was, time and time again. But you rooted for him because of the reasons behind his crimes, and because you wanted to see—at least I assume—him ultimately win. Very rarely is there a show that comes along like this that speaks to so many. Personally, I think it’s one of the darkest shows that I’ve ever seen (the scene in the last season where Jessie’s girlfriend is killed comes to mind, not to mention how Jessie is being held captive by the same mercenaries that had her killed), so much so that I’ve used it as a bragging point about the show when I’ve tried to get my relatives to watch it. Now, back to Walter White and why I believe Jessie Pinkman was in the show as long as he was—rumor was that originally the show creators planned to kill Jessie off early. I believe Jessie Pinkman was on the show to provide a contrast to Walter White. 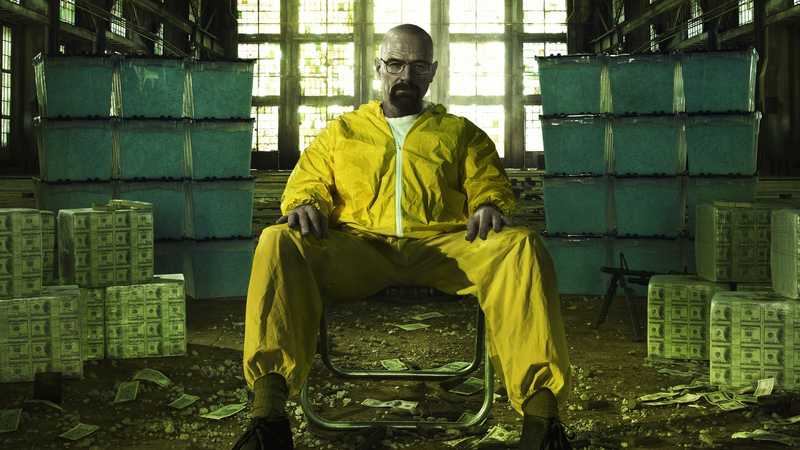 With Jessie on the show the viewer was better able to see just how bad Walter White was, was able to see the difference of a person fit for the role of a drug kingpin and a person that wasn’t. Jessie Pinkman’s presence on the show made Walter White’s character all the more memorable. And yes, Jessie Pinkman could be frustrating to watch at times because he was always messing so much up, but because of how callous and power hungry Walter White was, you had sympathy for the young man. At least, that’s how I see it. But to end this comment I want to say that I believe Walter White did bad things—and yes, actions speaks louder than words—but I don’t believe Walter was a truly evil guy. Not inside. Despite what he said to his wife in the final episode of the show he had his reasons for what he did, and he may have become addicted to the life at one point, but still, it was at one point rooted in something benign. The thing about Walter, Natarro, is that he makes you think about what he could have done with a little more effort at putting his brilliant mind to work on something that wasn’t illegal and wouldn’t devastate his family. Could he have been successful, and if he had been, in a legitimate field, would he really have been such a bad guy after all? Would he have still had an itch for the drug dealing lifestyle? Who knows? Something to think about. I really enjoyed your response jmb. Thanks for stopping by!